The problem of how often to disperse in a randomly fluctuating environment has long been investigated, primarily using patch models with uniform dispersal. Here, we consider the problem of choice of seed size for plants in a stable environment when there is a trade off between survivability and dispersal range. 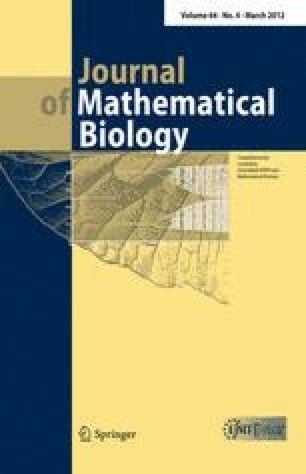 Ezoe (J Theor Biol 190:287–293, 1998) and Levin and Muller-Landau (Evol Ecol Res 2:409–435, 2000) approached this problem using models that were essentially deterministic, and used calculus to find optimal dispersal parameters. Here we follow Hiebeler (Theor Pop Biol 66:205–218, 2004) and use a stochastic spatial model to study the competition of different dispersal strategies. Most work on such systems is done by simulation or nonrigorous methods such as pair approximation. Here, we use machinery developed by Cox et al. (Voter model perturbations and reaction diffusion equations 2011) to rigorously and explicitly compute evolutionarily stable strategies. This work was done while the authors were at Cornell University and partially supported by NSF grant DMS 0704996 from the probability program.